This is probably either the best super hero film ever made or a close second. Everything that was done well in Batman Begins is improved upon and Heath Ledger’s Joker pushes Christian Bale’s Batman to the breaking point. Characters actually die and this film does not have a happy ending. 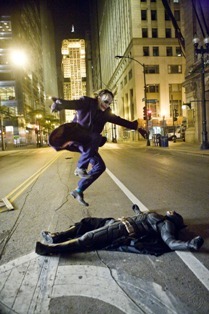 In this film the Joker represents Chaos while Batman represents Order; two opposing forces that are in a constant struggle without victory on either side being truly possible. Maggie Gyllenhaal replaces Katie Holmes nicely and Aaron Eckart is the perfect Harvey Dent. This film draws a huge amount of influence from my favorite Batman comic book the Long Halloween, which is about the mob being phased out in Gotham while super villains take over, Dent’s fall from grace, and a holiday killer. Take out the holiday killer and that is the Dark Knight in a nutshell. This is a long film that almost feels like two movies in one. The first act focuses more on Batman against the mob while the second act is about Batman’s conflict with the Joker. This film isn’t perfect though. The ending is forced and the conclusions the protagonists come to do not make sense; essentially that Batman needs to be blamed for the crimes of Harvey Dent’s Two Face in order to maintain his inspirational effect on Gotham City. What makes no sense is that during Dent’s killing spree the Joker had the city in complete panic so it would have made more sense to blame the crimes on the Joker, but that aside this movie is fantastic. A verry acrate review of my faviorate superhero/batman film of all time. I also find myself asking the qustion WHY NOT BLAM JOKER ? In a cause and effect kind of way Joker played a big role in turning Dent into Two Face bolth phsically and mentaly triggering his murder spree.